How do I name my product? 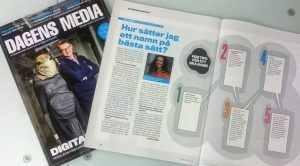 Katarina Nilsson was interviewed in the Swedish media magazine ’Dagens Media’ where she shared her five best naming tips. The article is written in Swedish and published in nr 18, 2016. Give us a call if you want us to translate!